Here is another review of a Japanese DIY cooking kit from Kracie. This time we are making edible doughnuts by just adding water. You can purchase these kits from any Japan speciality store but I got this directly from a supermarket in Asia. You get 2 doughnut batter mix (cocoa and custard flavour), 3 decoration sauces (vanilla, strawberry and chocolate), a packet of crunchy biscuit/wafer crumbs, some topping sprinkles, and all the tools you will need including spatula, molds and piping bag. You get a Cruller and Doughnut mold and can make 4 1/3 scale sized doughnut sweets so I made 2 of each designs. 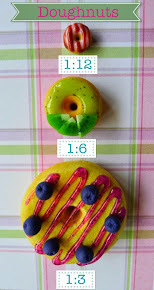 The instructions also include some illustrations on how you can decorate your doughnuts. Bear in mind, you can do anything you want with them so be creative and just go crazy! Chocolate and custard doughnuts coated in vanilla and strawberry sauces with chocolate drizzle. Topped with more pastel sprinkles. I tried to use up most of the ingredients it came with. They really give you a generous portion of sauces and toppings! Each piece is practically caked in thick candy icing and I still had plenty of leftovers. Leftovers went straight into my mouth, lol. It would have been better if they gave us more doughnut batter mix to make 6 doughnuts. There was easily enough decoration sauces and toppings for 6 designs. So how does it taste? When my husband saw them he thought it was another Littlest Sweet Shop miniature and commented that it looked real. I told him it WAS real and he could eat it too. So he tried a custard one and said that he actually liked it. It tasted oddly stodgy like a real deep fried doughnut even though it's just another clever way of engineering candy. However it was still quite yummy and not too sweet for my taste. The toppings gave it an extra crunch but the sauces are on the sweet side so use less if you do not want to make your doughnuts too sweet. Hope you enjoyed that review! I've made similar reviews here on the blog so just search for it. I'm currently in the middle of a big commission and constructing a Halloween gingerbread house. I will also be taking a 2 week holiday in October but will try to debut more new items by next week.